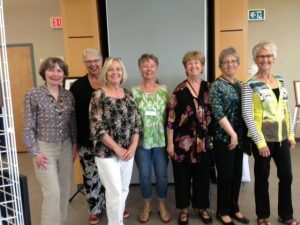 Members of the Art Group gathering at the centre in preparation of our very first Art Show and sale on May 26th, from 10:00am until 2pm. We are looking forward to sharing our art work with you and your friends and family! 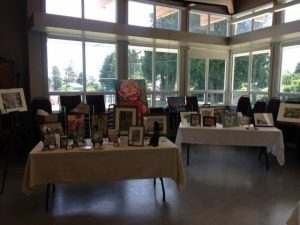 Some of the wonderful art work shown at the Art Show on Saturday, May 26, 2018. The Art Group was pleased to host a successful St. Patrick’s Day 2019 lunch. 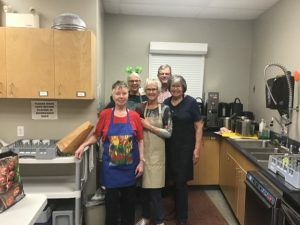 Many thanks to the preparation team (pictured above) and to the wonderful serving skills of Brenda Howells and Donna Denman. The preparation team from left to right, Mildred Vanommen, Jane Bishop, Judy Nygaard, Von Bishop, Edna Considine. Our Art Group at CB55+ is expanding with an influx of new members, new inspiration and wonderful new talent. A warm welcome to the artists who have joined us this year! We are all so grateful to be able to come together to laugh, create, and support each other in this lovely space. Look for more information in the coming weeks about our Art show planned for May. Some of our members will be selling their work but we also want to take this opportunity to show you what goes on (aside from gales of laughter) on Monday afternoons in the Studio! The art group will continue to meet on Monday afternoons in the Studio, from 1:30 – 4:00 pm. We even have a small stash of on-site supplies for beginning artists to try.